Can Genetics Explain an Unhealthy Gut? Recent research into genetics has revealed that our genetic makeup influences our gut health as much as diet and lifestyle. Non-secretor carriers of the FUT2 gene are more likely to show signs of Crohn’s disease, celiac disease, inflammatory bowel disease, and Candida overgrowth. While we can influence our DNA with healthy choices and by managing stress, our DNA is the blueprint. It plays a deciding role in the health of our inner ecosystem. Bifidobacteria are probiotic bacteria. They are good for the body, and they promote wellbeing. As babies, most of us have an inner ecosystem teeming with bifidobacteria—especially if we are breastfed. But as we age, the numbers of bifidobacteria decline. (2) This is unfortunate since bifidobacteria repair leaky gut and protect against Candida overgrowth. What Is the FUT2 Gene? Roughly 20% of people carry an FUT2 gene variation, making them unable to house robust bifidobacteria in the gut. This may leave you vulnerable to autoimmune disorders, inflammatory bowel disease, and urinary tract infection. The FUT2 gene decides whether or not the body will show blood type tags in bodily secretions (like saliva, gastric juice, and breast milk) and in the lining of the gut. Everyone has a blood type (like blood type A, B, AB, or O). But not all of us communicate our blood type in saliva and in the mucus lining the gut. These secretions (and whether or not they contain tags for our blood type) influence the kind of bacteria that grow in the gut. Roughly 20% of people carry a variation of the FUT2 gene that does not allow the body to reveal its blood type in secretions and in the lining of the gut. (5) This 20%, called non-secretors, is also unable to house a robust community of bifidobacteria. If you fall into the 20% that carries the non-secretor variation of the FUT2 gene, it is important that you place special emphasis on your diet. Remember—non-secretor carriers of the FUT2 gene are more likely to show signs of Crohn’s disease, celiac disease, inflammatory bowel disease, and Candida overgrowth. Because non-secretor carriers of the FUT2 gene are genetically wired to have a wounded inner ecosystem, we suggest eating cultured foods with every meal. We also suggest supplementing with a high-quality probiotic that contains plenty of bifidobacteria, like the probiotic found in Body Ecology’s Multi-Pack. Non-secretor carriers of the FUT2 gene are more likely to suffer from heartburn and infection with H. pylori—a type of bacteria that infects the stomach. Because of this, researchers have found that the FUT2 gene has the most impact on your ability to absorb vitamin B12 from food. (13) Vitamin B12 helps the body make blood and new DNA. It also supports the immune system and the nervous system. We also absorb vitamin B12 from good bacteria living in the gut. Once again, this means that cultured foods and cultured drinks are top priority. 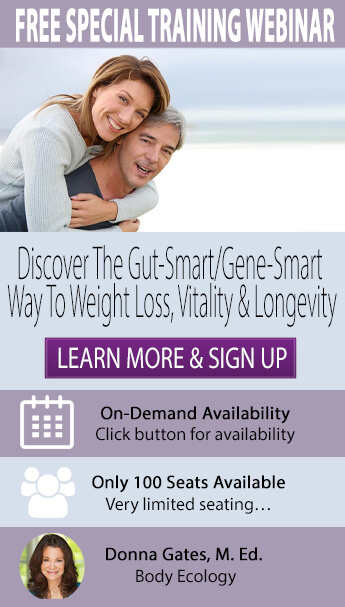 Your genes are just as influential to your gut health as your diet and lifestyle choices. DNA is the blueprint for your inner ecosystem that can be affected by the healthy choices you make. Specifically, the FUT2 gene determines how much bifidobacteria you carry in your gut. This gene is important because your body needs these probiotic bacteria for overall wellbeing. Bifidobacteria help to protect against harmful Candida overgrowth and leaky gut. Close to 20% of people carry an FUT2 variation that makes the gut unable to house a robust community of bifidobacteria. This may leave you vulnerable to autoimmune disorders, inflammatory bowel disease, urinary tract infection, Candida overgrowth, B12 deficiency, and some forms of anemia. Support your inner ecosystem with cultured foods, cultured drinks, and probiotics—like those found in Body Ecology’s Multi-Pack. Watch for signs of B12 deficiency or anemia—fermented Spirulina is an excellent gluten-free, vegan source of B12. Wacklin, P., Mäkivuokko, H., Alakulppi, N., Nikkilä, J., Tenkanen, H., Räbinä, J., ... & Mättö, J. (2011). Secretor genotype (FUT2 gene) is strongly associated with the composition of Bifidobacteria in the human intestine. PLoS One, 6(5), e20113. Patel, P. J., Singh, S. K., Panaich, S., & Cardozo, L. (2014). The aging gut and the role of prebiotics, probiotics, and synbiotics: A review. Journal of Clinical Gerontology and Geriatrics, 5(1), 3-6. Goto, Y., & Ivanov, I. I. (2013). Intestinal epithelial cells as mediators of the commensal–host immune crosstalk. Immunology and cell biology, 91(3), 204-214. Fukuda, S., Toh, H., Hase, K., Oshima, K., Nakanishi, Y., Yoshimura, K., ... & Ohno, H. (2011). Bifidobacteria can protect from enteropathogenic infection through production of acetate. Nature, 469(7331), 543-547. Kelly, R. J., Rouquier, S., Giorgi, D., Lennon, G. G., & Lowe, J. B. (1995). Sequence and Expression of a Candidate for the Human Secretor Blood Group α (1, 2) Fucosyltransferase Gene (FUT2) HOMOZYGOSITY FOR AN ENZYME-INACTIVATING NONSENSE MUTATION COMMONLY CORRELATES WITH THE NON-SECRETOR PHENOTYPE. Journal of Biological Chemistry, 270(9), 4640-4649. McGovern, D. P., Jones, M. R., Taylor, K. D., Marciante, K., Yan, X., Dubinsky, M., ... & Rotter, J. I. (2010). Fucosyltransferase 2 (FUT2) non-secretor status is associated with Crohn's disease. Human molecular genetics, 19(17), 3468-3476. Parmar, A. S., Alakulppi, N., Paavola‐Sakki, P., Kurppa, K., Halme, L., Färkkilä, M., ... & Einarsdottir, E. (2012). Association study of FUT2 (rs601338) with celiac disease and inflammatory bowel disease in the Finnish population. Tissue antigens, 80(6), 488-493. Smyth, D. J., Cooper, J. D., Howson, J. M., Clarke, P., Downes, K., Mistry, T., ... & Todd, J. A. (2011). FUT2 nonsecretor status links type 1 diabetes susceptibility and resistance to infection. Diabetes, 60(11), 3081-3084. Sheinfeld, J., Schaeffer, A. J., Cordon-Cardo, C., Rogatko, A., & Fair, W. R. (1989). Association of the Lewis blood-group phenotype with recurrent urinary tract infections in women. New England Journal of Medicine, 320(12), 773-777. Hurd, E. A., & Domino, S. E. (2004). Increased susceptibility of secretor factor gene Fut2-null mice to experimental vaginal candidiasis. Infection and immunity, 72(7), 4279-4281. Rupp, C., Friedrich, K., Folseraas, T., Wannhoff, A., Bode, K. A., Weiss, K. H., ... & Gotthardt, D. N. (2014). Fut2 genotype is a risk factor for dominant stenosis and biliary candida infections in primary sclerosing cholangitis. Alimentary pharmacology & therapeutics, 39(8), 873-882. Tanaka, T., Scheet, P., Giusti, B., Bandinelli, S., Piras, M. G., Usala, G., ... & Ferrucci, L. (2009). Genome-wide association study of vitamin B6, vitamin B12, folate, and homocysteine blood concentrations. The American Journal of Human Genetics, 84(4), 477-482. Tanwar, V. S., Chand, M. P., Kumar, J., Garg, G., Seth, S., Karthikeyan, G., & Sengupta, S. (2013). Common variant in FUT2 gene is associated with levels of vitamin B12 in Indian population. Gene, 515(1), 224-228. Usharani, G. (2012). Spirulina Cultivation A Review. International Journal of Pharmaceutical & Biological Archive, 3(6). Baroni, L., Scoglio, S., Benedetti, S., Bonetto, C., Pagliarani, S., Benedetti, Y., ... & Canestrari, F. (2009). Effect of a Klamath algae product (“AFA-B12”) on blood levels of vitamin B12 and homocysteine in vegan subjects: a pilot study. International journal for vitamin and nutrition research, 79(2), 117-123.